Error	1	Error occurred in deployment step ‘Add Solution’: 0x80070005Access denied. You would have to be a site collection administrator in order to deploy the solution to a site collection. You can add a user to that group either by adding the user as the primary or secondary site collection administrators in Central administreation, or by adding a user to site collection administrators from the site settings in the site collection root. Will your solution work for MySite branding as well? No, it will not right out of the box. But, if you modify it a bit.. 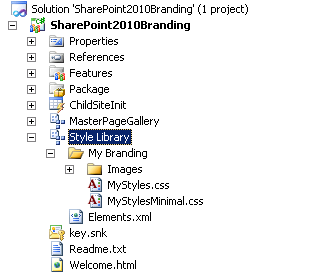 Create a copy of the mysite.master that is available in SharePoint 2010 (using SPD?) then add it to this solution under the MasterPageGallery ‘folder’. 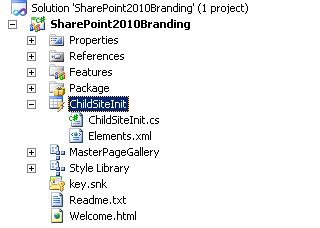 Next, add an ‘if section’ to the main.eventreciever.cs and the childsite init that sets the mysite.master as master for sites created on the SPSPERS sitetemplate (Mysites). I can see the difference now. The first case is when new Sites is being provisioned, the second case is turning on/off the custom masterpages when activating/deactivating the feature. Hi Kjaps. You got it, one is for feature activation, one is for site creation. The solution is not a perfected appliance, it will have to be modified by every user so that it fits their needs. I chose to disregard the if check on deactivation since I could live with it, for others, deactivation usually is followed by a new activation setting the masters back to the correct one. No problem, the reason you get that problem is because Foundation does not have the publishing features, and SPUrl is a publishing feature. I have added code in the readme.txt to circumvent this, the places with SPUrl has to be replaced with workaround code. A lot of time went into doing that…so please pay me back by submitting a rating at the gallery site. Thankyou very much.another question though.how do you activate drop down menu in foundation?is it possible or it only works on server?? I want to try this to our sharepoint 2010 Online site but I got this error when trying to deploy. 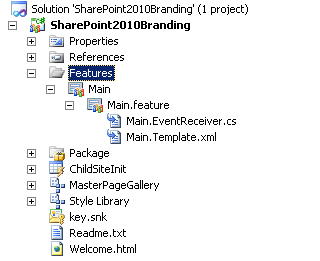 I’m new with Sharepoint 2010 Online / 365 and VS2010 development I wonder if you could give me a hand to this.. 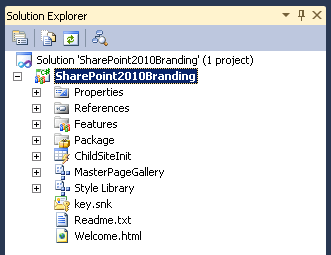 I have to check, I have used this solution myself in SharePoint online without any major issues. Perhaps there could be something with the latest update…? I’ll et back to you on this. I think I got this one now…you said you tried to deploy…you have to package it as a wsp, upload it to the solution gallery and then activate it. You can’t remote deploy yet to anything (thats solved in the coming Visual Studio 2012). 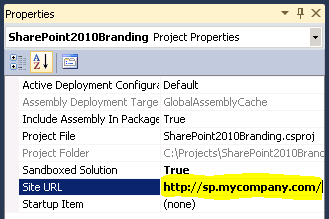 Instead of deploy, select package, then you will fins the wsp in the projects folder, projectname, bin, debug, projectname.wsp. hi thomas thankyou i got it to work. another question though how can i put drop down menus?i cant seem to make it work on my sharepoint foundation.from what ive read on other forums drop downs can only work on servers not the foundation is that true or is there a way to make it work?? Thankyou very much.another question though.how do you activate drop down menu in sharepoint foundation?is it possible or it only works on server?? Glad you got it to work, not sure about the Foundation Navigation though, let me check that out and get back to you? Have spent some time on looking into this, I alsways forget the differences in Foundation, basically because I spend to little time in Foundation. You are correct, the simple answer would be that No, SPF does not have dropdowns or dynamic navigation. It has the toplinks setting which is very rough and static. The more complex answer, is that oob in foundation there is no way to have dropdowns or to configure the global/top navigation in more levels than one but using code there is. I will not give you a complete answer, I have none to give, but, this thread on Tehcnet gives you a lot. Look at Becky’s answer and if you follow the first link, you will find a list of how to’s and walkthrough’s on the ASP.net sitemap provider that is what yoy would need to customize. It is doable, but takes a bit of dev skill and time. that would be great thomas.thank you. Thanks alot for your time and for sharing this! I’m looking forward for the Configuration and Modification! I’ll get to the configurations part…soon. If I login with another user, there will be an error like this “http:404, file not found”. How can I resolve this? I’m guessing here, but it could be that you rsource files, master and images, have entered a checked out/unpublished state. CHech those in the style library and publish them all. It could also be due to a misspelled filename or path. I seem to be having untold difficulties simply deploying the base solution after downloading it thereafter I will be applying my changes. 1) I ran vs2010 as admin then just build, package, deploy. I get Error	“1	Error occurred in deployment step ‘Add Solution’: Sandboxed code execution request failed. Hmmm well if it is not deployed on the farm I won’t be able to install it at the webApp level. First, make sure that you have the ‘Microsoft SharePoint Foundation Sandboxed Code Service’ Service running in the farm. Since the Project by default is set to run as a Sandboxed solution(req for online etc. ), this has to be started first. Try that and see where you end up? 2) Just get the SBP working I am not using my custom stuff just your newly downloaded vanilla project. To get my demo working I have just doing my prototyping in SPD but I will need to show that my masterpage can be deployed via a feature. Could it be that you have 2010 Foundation? Or that you are running on Windows 7? Thomas, Yep it is strange. I am using sp2010 Ent of win2008R2 in all cases and no changes to your code other than host url. I will try today to go back and check that admin permissions that were previously set up and also try another sandboxed feature. I never had this much with a farm scoped solution lol! 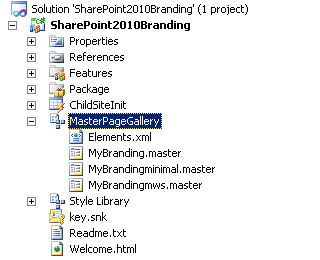 Try again if you have the possibility, create a fresh site Collection and use a Team Site(STS#0) as the site template. Then, try again the vanilla SPB and deploy. Step 2(if needed) Try and activate the Publishing feature on the site Collection level, then deploy again. Thats what I can think of…no wait. Check your URL. if the AAM’s and bindings are screwed up, it will fail as well. I had to revisit this for another project and can report that it does deploy in a new sc with publishing infrastructure feature enabled. MyBranding.Master when set as the default master works fine. Now I want to apply my custom styles to the MyBrandingMinimal.master. like minimal master this gives a few missing Placeholders errors, viewed in ULSViewer, when set as the default master. I have been busy adding PlaceHolders: PlaceHolderMiniConsole, PlaceHolderTitleRightMargin, and PlaceHolderBodyRightMargin. Did you have any issues with MyBrandingMinimal.master. Actually, no. But remember, the minimal master is only intended to be used with the sitetypes that normally have the minimal master. Like search center and some other. I added for fun a minimal navigation to it because the search center don’t have one by default. If you have configured it for a ‘normal’ site like a team site, then it will cause errors. The regular master is for regular sites and the minimal is for minimal sites. There is no mixing between them. 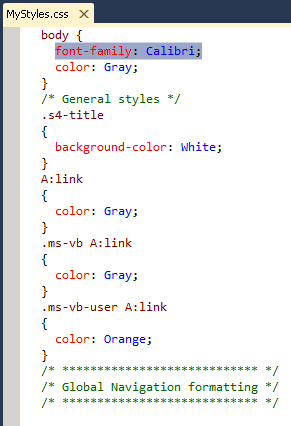 Hey it looks good.It is posible to use it in VS2012? Currently, I have not converted it to VS2012 but it is on my todo list. WIll let you know once it has been done and a new version is published. Ok? Thomas, Yes it does ( doh!). I wanted to a fairly blank canvass but thin case I carry on customising mybranding.master and hide the bits the client does not want visible. Thanks. Sounds good, if possible, use the css to hide controls in the master, that way, you do not have to madify the master that much. Or, at least, comment them out. You are Da Man, Thanks for such a wonderful article and step by step detailed info. It’s great help for people with admin back ground to step in to development world. Thanks for the feedback, this is exactly what I was aiming for, to help non-developers get started. 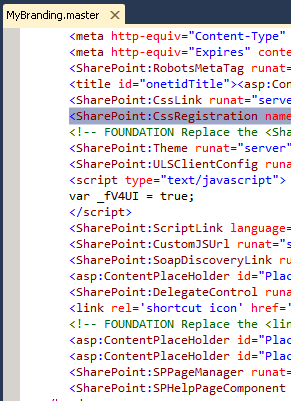 Wonder if this will work with VS 2012 or Sharepoint 2013 for publishing site ? The short answer is no, not right away, and not with 2013. 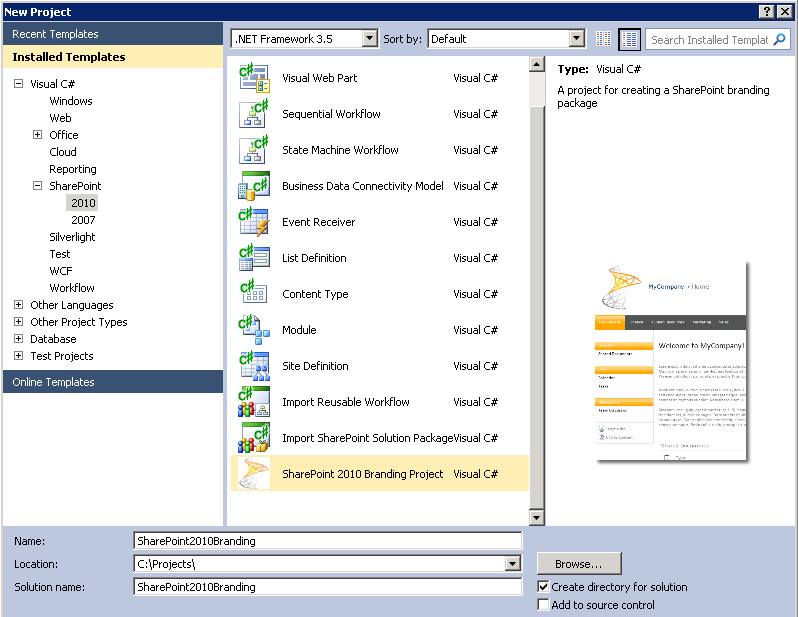 A new version is on its way that will be for VS2012 and SP2013. when is no 3 coming out?? no 3 was unfortunately never produced…and never will be. With the release of 2013 I was forced to focus on other areas.